Yooo. How are ya on this fine Monday? Have you gone on any movie dates recently? My boyfriend & I frequent [the most amazing movie theater ever created] Studio Movie Grill - Scottsdale quite often. They have these plush arm chairs and individual swinging tables for your food goodies. Because, oh yeah. I forgot to mention they also offer a full array of snacks, dinners, desserts, and a full bar... which they bring directly to your seat, rather than waiting in a concession line! So yep. We go there just about every week. The only issue being that, like most theaters, it gets downright chilly in there at times! So the ongoing battle of looking Summertime Cute vs. Polar Bear Hoodie raged on. That is, until I got this new white blazer and thought it was the perfect mediator in my ongoing movie theater heat struggle. It's light enough that I don't [quite] die walking from the car to the theater (Hey! Even at 9 PM, it's still over 100 degrees here in Arizona, people!) -- yet, it's sturdy enough to keep me warm in those oh-so-sweet seats. Use promo code "EVERYONE" for 30% off your purchase at OldNavy.com until 7/23! Use promo code "EVERYONE" for 30% off your purchase at Gap.com until 7/23! What's your go to movie theater outfit? Do you grin and bare it in a cute sundress? Or do you just say "Screw it" and whip out the yoga pants (Hey, no judgement here if you do. You're gonna be there for 2+ hours after all, so you might as well be comfy, eh?!)? I tend to stick to a pair of comfortable jeans and some sort of sweater/blazer/jacket. That theater sounds like a fabulous place! 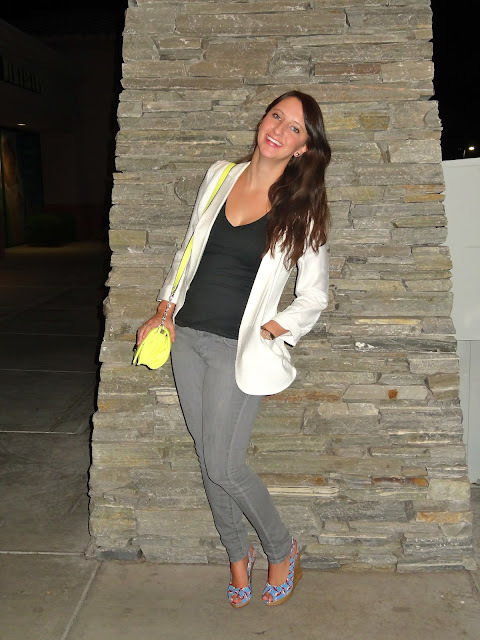 Love your white blazer it is the perfect cover for the chilly air conditioning! Great movie outing look! cute outfit! I always bring a sweater or a jacket to the movies too because i'm always freeeezing.